House Democrats tried — and mostly failed — to divert funds allotted for border security and the Texas Department of Public Safety to other departments during Tuesday’s budget debate. "We did some negotiations," he said. State Rep. César Blanco, D-El Paso, sought to transfer $5 million from the DPS’s general operating budget to local law enforcement entities to establish a Border Death Humanitarian and Identification Fund. But Blanco, who has been highly critical of what he said is DPS’s inability to prove that the current border surge is yielding positive results, lost out after his amendment was tabled. An amendment from state Rep. Roland Gutierrez, D-San Antonio, aimed to divert $10 million from the department’s general revenue fund to its emergency preparedness operations. That failed, as did an attempt to transfer $2 million from DPS to the Parks and Wildlife Department. State Rep. Ryan Guillen, D-Rio Grande City, attempted to limit DPS’s mission on the border to interdiction, intelligence and organized crime investigations. He also sought to eliminate the department’s ability to issue traffic citations. Guillen’s amendment was also tabled. State Rep. Mary González, D-Clint, failed to divert about $673,000 from DPS’s operating budget to aid residents of colonias, pockets of impoverished neighborhoods that are prevalent on the border. But she ran into opposition from Rep. Jason Villalba, R-Dallas, who said taking the money would make Texas less safe. There are about 260 colonias in González’s district. The amendment was eventually tabled. But one border lawmaker had tentative success in transferring money from DPS to his district for local law enforcement grants. An amendment by state Rep. Alfonso “Poncho” Nevárez, D-Eagle Pass, would take $10 million from the agency for that effort. 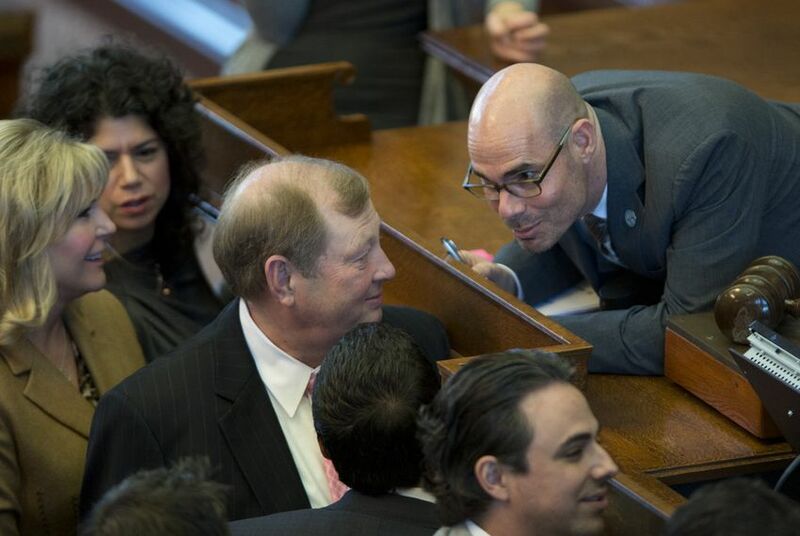 But it’s contingent upon another measure — Republican state Rep. Dennis Bonnen’s House Bill 11, an omnibus border security bill — making it to Gov. Greg Abbott’s desk and getting signed. But the success came after a lengthy back-and-forth between Huberty and members upset at where the funds would be taken from. Huberty offered one amendment that would have taken $2.2 million from the Texas Agriculture Department. That didn’t sit well with Democrat Tracy King, D-Batesville, the chairman of the House Agriculture and Livestock Committee. Huberty eventually pulled that amendment and instead took $2.2 million from the Texas Facilities Commission. The House budget must still pass the Senate, and Tuesday's budget battle indicates the two chambers will be at odds over border security spending. The Senate's version has stayed at $815 million, which includes extending the deployment of the Texas National Guard on the border until 2017.